The war had already been going on for more than two years on that day in December, 154 years ago today. Parts of the rebellious south had been brought under northern control and it was time, the President thought, to consider how to put the country back together. And so, 154 years ago today, President Abraham Lincoln issued his Proclamation of Amnesty and Reconstruction. and then it went to the heart of the matter: a plan for bringing the rebelling states back into the Union when 10 percent of the eligible voters had taken an oath of allegiance to the United States and granting amnesty — a full pardon — to all but the highest Confederate officials and military leaders. And oh… those pardon and amnesty papers. What a treasure trove they are for genealogists. For any of us with southern ancestors — The Legal Genealogist included — these records and those that came about later under other Presidential proclamations or the statutes when Congress got into the act are simply gold. All Civil War pardon and amnesty records are federal records, and so are all held by the U.S. National Archives. But they’re divided up among a number of different record groups. Most of these are textual records only (meaning you have to access them in person at the National Archives), but there are a few that you can look at online. The amnesty oath of one Robert E. Lee, for example, has been digitized by the National Archives. These records have been digitized and you can see them on Fold3.com, on Ancestry.com and through the National Archives catalog. • RG 46: Petitions and Memorials, Resolutions of State Legislatures, and Related Documents Referred to Committees, 40th – 41st Congresses, and the Accompanying Papers File, 39th – 44th Congresses, 1865 – 1877. • RG 233: Petitions Submitted to the U.S. Senate Requesting the Removal of Political Disabilities of Former Confederate Officeholders, 1869 – 1877, now on microfilm as M1546. There’s more to be found for sure. Check out Record Group 393 (Records of U.S. Army Continental Commands, 1821 – 1920) for records of the Provost Marshals, since they kept registers of applications for pardon and lists of those who’d taken the oaths of allegiance. And Record Group 109 (War Department Collection of Confederate Records) includes the Register of Confederate Prisoners and Deserters Released on Taking the Oath of Allegiance to the United States, 1863 – 1865, and the Lists of Civilians Taking the Oath of Allegiance or Giving Bond, 1862 – 1864. For a great overview of all these records, check out archivist John P. Deeben’s 2015 presentation “Restoring the Brotherhood of Union: Confederate Pardon and Amnesty Records, 1865-1877,” given as part of the National Archives Know Your Records seies. You can watch it on YouTube. 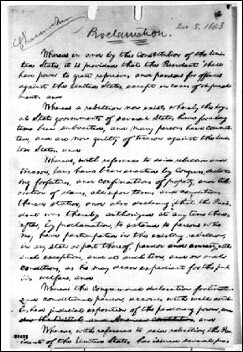 And all of it begun by a document issued 154 years ago today.